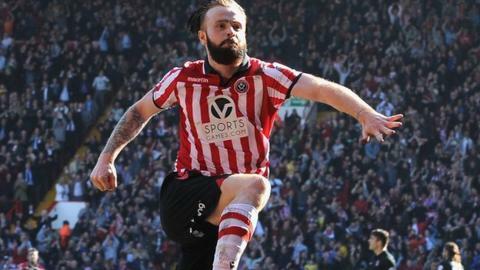 Sheffield United defender John Brayford says he had no problem taking a pay cut to rejoin the club from Cardiff City. The 27-year-old spent the end of last season on loan with the Blades, making 20 appearances in all competitions. He returned to Cardiff in the summer and played 28 times for them this season before returning to Bramall Lane on Saturday. "It's no secret I've taken a cut, but it was about being somewhere I felt loved," he told BBC Radio Sheffield. "A few things went on in my first six months at Cardiff and then I came here and it made me think I'd rather have the memories than the money. "I could have carried on picking up my money and playing at Cardiff but my pride always made me think that what went on in those first six months there would always stick with me. "I don't regret going there at all but it feels like it was fate for me to be here. I always saw myself coming back here." Brayford joined the Blades on loan last January after making just two appearances in his first six months in Cardiff. The former Derby man helped the Blades reach the FA Cup semi-final in his first stint with the club and believes they can push for a place in the Premier League in his second spell. Nigel Clough's side are currently eighth in League One and potentially just one game from Wembley return as they trail Spurs 1-0 from the first leg of their League Cup semi-final. "I certainly think we should be in the Championship and an optimist will say we could be in the Premier League," Brayford said. "You look at teams like Southampton who have done it and, no disrespect, but we're probably a much bigger club. "I'm not putting pressure on anybody but why shouldn't we strive for that? I wouldn't come here if I didn't think we could go right to the top."